It seems like international investing is all the rage these days. It seems like everywhere I look, someone is recommending investors to add an allocation to foreign stocks. Many “experts” have claimed that individual investors should not be picking individual stocks, but they should be picking separate asset classes instead. In other words, rather than create my own portfolio of 30 – 60 individual dividend paying stocks and some fixed income, I am told that I should pick a portfolio of 10 – 15 separate asset classes, and then pay someone else to hold the stocks for me and charge me annual management fees for this "service". These experts have cost investors millions of dollars in missed opportunities. Over the past decade that I have been investing, my international stocks have done much worse than my exposure to US securities and US fixed income. I am lucky that my allocation of foreign equities has always been low. This is because I have focused my effort on US multinational companies, which generate a large portion of revenues and profits from abroad. My other issues with international companies is that the culture of regular dividend increases that we have in the US is not prevalent. Most foreign companies pay fluctuating dividends. These dividends vary from year to year in local currencies. They fluctuate as well, when converted to US dollars. I spend US dollars. Therefore, i have less confidence in the predictability of the amount of my foreign dividends. In the case of adding international stocks to US portfolios, we have seen that this has been a bad decision for US investors over the past 20 years. In my personal retirement account, the small exposure to foreign stocks has turned out to be a bad decision over the past decade. In fact, buying Kinder Morgan in 2008 and 2009 has turned out to be a much better decision that buying an international index fund. International allocation however has been a good decision for investors based in other countries. What makes investing just a fascinating area is that we do not know if the next 20 years will be the same as the preceding 20 years. It generally makes sense that you want to have a diversified portfolio, which is not overly dependent on one region. If you are based in the US, earn and spend your money there, it may make logical sense to buy some international stocks for diversification. After all, if things don’t go as well as expected domestically, you will be somewhat protected because of your exposure to other assets. The saying is that noone can predict the future, which is why you never know if the tides will be reversed over the next 20 years, and it could very well turn out that our stock market doesn’t do too well. I would not be surprised by that, since many US companies are wasting money on buybacks at inflated prices, and are failing to grow earnings, while at the same time paying miniscule dividends relative to historical standards. Plus, current valuations seem a little overstretched, even for myself. International stocks on the other hand have lower valuations today, and higher dividend yields. If earnings do not grow by much over the next decade, it is quite possible that international equities do better than US equities. If you purchase overvalued equities, you may experience poor initial returns. For example, an investor that was based in Japan in the 1980s, would have definitely benefited by holding some international stocks. This is because the Japanese stock market was inflated in the 1980s, and had stratospheric P/E ratios and dividend yields of 0.50%. 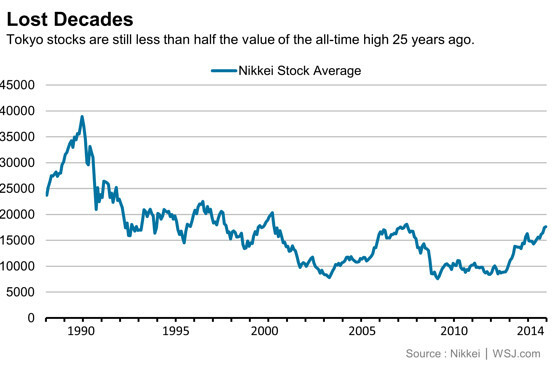 It is no wonder that Japanese stocks have provided terrible returns for the subsequent 25 - 30 years. Foreign equities on the other hand, did really well. An investor from Russia or China at the beginning of the last century, would have done really well by adding some international stocks or bonds ( assuming that they managed to escape the red army). For an investor based in the US however, investing international has not worked out too well in general. I am personally all for diversification. However, I do not want to overdiversy, or even worse- diworsify. The first potential issue is that many investing abroad assume that the current system of international globalization and trade would persist throughout their investing timeframe. The world is interconnected today, with capital and ideas moving quickly across the globe. This is good for trade. However, the world was equally interconnected at the beginning of the 20th century. You had government bonds trading around the world, and many companies listing their shares in multiple exchanges. The idea of globally diversified portfolio management was taking shape. In fact, many investors from the Old World invested heavily in railroads, utilities, manufacturing facilities, agricultural and other enterprises around the world. The telegraph connected the world, and financial markets. If you have read books about investing from the end of 19th century and beginning of the 20th century, you can always find examples of investors who used telegraph to take advantage of arbitrage opportunities in stocks listed in the US and in London for example. Unfortunately, the first worlds war put an end to this globalization. The flow of global capital was halted with capital controls. Certain countries nationalized whole industries, leaving investors with complete losses of capital. Capital controls may make it difficult to take your profits out of the country, to reinvest elsewhere or take out dividends. The first world war kind of took everything by surprise. The world was never the same after it. Most experts who recommend international investing do so, because they data set they are using starts in 1969. Therefore, they are blind to the risks faced by investors from before 1969. The second potential issue is that the governments where you are investing will be welcoming after you need to cash out of your investment. Based on the research I have done, it seems like international investors had provided capital to grow the economies of emerging markets such as Argentina, Russia, China, India at the beginning of the 20th century. The United States and Canada were also some of these emerging markets. For example, Canadian Pacific was owned by foreign investors ( a fun thing I learned by browsing stock quotes in old newspapers from 100 years ago) There are parallels with the situation today, where emerging markets are supposed to be the next hot thing. These markets are supposed to be growing all the way up until they reach a similar level of GDP per capita as the more developed countries. My historical research has uncovered that in the previous period of globalization over a century ago, these expectations did not work very well for investors. For example, stock markets in countries like Russia were shut down in 1917. 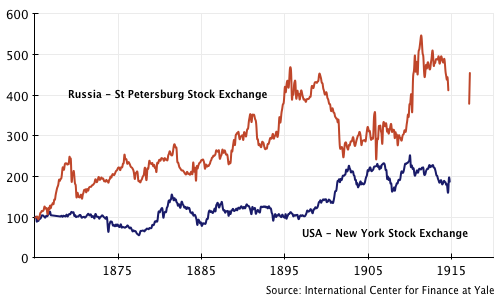 And for the record, based on the research I reviewed, it looks like the Russian stock market did much better than the NYSE between 1865 – 1917. Unfortunately, the Bolshevik revolution resulted in total losses of capital for international investors. While the Russian economy kept growing and innovating to a certain extent over the next 70 years, this did no good for foreign investors who had risked their hard earned capital to invest in stocks and bonds from Tsarist Russia. During the 20th century, you had other countries such as China, Poland, Czechoslovakia, Romania where communism resulted in total loss for the foreign investors. My family didn't own stocks at the time, but had its land nationalized after the communists came to power in Eastern Europe in the 1940s. They were lucky that they were not rich (middle - middle class), otherwise, they would have lost something even more valuable - their lives. Other countries, which lost the first world war had their investments expropriated. For example, German shareholders had their shares nationalized. This is why we have a company named Merck Inc in the US, and a company called Merck KGA in Germany. The US assets of the German firm were taken from it, and I do not believe it was adequately compensated for this. In other situations, you may have countries where the general economic environment deteriorates to the extent that profits cannot be repatriated back home. A prime example today is Venezuela. As I review the filings of various companies I own, I have noticed regular charges related to the devaluation of the currency of Venezuela. When Clorox (CLX) decided to leave Venezuela, the stock price jumped by a lot since the decision. It has never looked back. Many other companies are trying to stay, despite the insurmountable odds. I believe that Clorox did the right thing by bailing out – when things get better, they can always get back in. And of course, I have not even started to talk about oil assets for companies like ConocoPhillips (COP), that were nationalized by the Venezuelan government. The most interesting case study I have looked at is Argentina. The country had one of the most developed economies in the world 100 years ago. Today, the country is considered an emerging market. It has defaulted several times on its foreign debts. I do not believe that investors did very well investing in Argentina during the 20th century. Last year, I read a study that showed the returns of select global markets in the 20th century. The returns were generally pretty good. Unfortunately, I had spent some time studying history, before becoming fascinated with the stock market. It is very interesting to note that of the countries that had a stock market in 1900, only a handful did well for investors. Unfortunately, the study I reviewed did not include the performance of all of those countries that ultimately failed investors, but had a stock market in 1900. Examples include Argentina, India, etc. A third thing I started to think about around BREXIT was related to global trade unions. There are so many countries today that are part of a trade union. If this stops, it could impair the value of business relationships and reduce the flow of goods and services across borders. For example, if the UK leaves the EU, this could trigger a domino effect as other countries leave the union. Other participants in trade unions could be “inspired” by all of this, which could jeopardize global trade. As investors, we all assume that everyone wants more interconnected economies, free trade, because we as a society benefit. However, not every individual wins from globalization. Let’s look at a situation where I used to make shoes all my life in my factory job in the US, and made a comfortable middle class salary of $20/hour. Let’s assume that my job is outsourced when I am in my late 40s or 50s, because foreign labor is cheaper. I would have few career options for me. I find it challenging to learn new skills in my 30s – I would imagine how difficult it would be to learn new skills in my 50s. This is a person that has lost from globalization. Everyone else wins however – the person in the emerging market has a job that pays more than they have ever earned before, and is able to escape the poverty trap. The corporation that employs them makes more money. The consumers benefit, because they are able to get cheaper shoes. It is quite possible that the UK voters are setting an example for the rest of Europe, or even the world. However, the effects of this vote will not be fully understood until 5 – 10 years from now. We can all hope that it doesn’t matter in the end. If the US ends up doing something really dumb over the next one or two decades, some small allocation to foreign equities could potentially help. However, I would not put more than 20% of my net worth in foreign stocks due to risks mentioned in this article. Actually, in my 401 (k), I limit that exposure to 20% of my equity exposure ( which is an effective total portfolio allocation of 16%). This is more for insurance purposes, than anything else. I do hold some international stocks such as Diageo (DEO), Unilever (UL), Nestle (NSRGY) etc. Overall, investment in international companies poses some risks. These risks include difficulty repatriating profits due to capital controls, currency depreciation or nationalization of your business. Other risks include changes in the political landscape, which leads to an increasingly difficult terrain for foreign investors. This is why I believe that it is preferable for a US investor to invest in US multinational companies which have operations abroad. They are getting the benefit of international diversification that way. If foreign governments increasingly target the product or service of the US company, at least it will have its US operations under the worst case scenario. Under the more likely scenario of continued globalization, the US company will be earning more across the globe, and then distributing them to you, the US shareholder with much less hassle ( one of which is the foreign tax withholding on dividends). I would think that if a foreign company has troubles abroad and in its home base, it would be difficult for me as a US shareholder to keep generating money. It is possible that I won’t have access to the US subsidiary if everything else is nationalized. My intent is not to learn the hard way about international laws with my hard earned money. But let’s face it – life is unpredictable. The analysis of the past shows that the future is largely unpredictable. Studying the investment climate in countries like Russia, Argentina, China, from the beginning of 20th century show that some international diversification can help. While the US is a prosperous country today, we do not know what the landscape will look like 30 – 40 years from now. Even if the US continues to be a prosperous country, it is possible that its investors don’t do as well if we get increased taxation, increased regulation in certain sectors, or increased redistribution of resources towards employees and away from capitalists. This is why I have exposure to blue chips which are based abroad trough my retirement plan at work and some individual dividend paying stocks like Diageo, Nestle, Unilever in case I am wrong. I view this as insurance, in case I am wrong. My bet however is that the US will do very well over this century. There is an old chap from Omaha that agrees with me. The US is a magnet for the best and brightest minds in the world, it is one of the world leaders in innovation, it has enviable demographics relative to the rest of the world, and it has the rule of law that favors investment. Most importantly, and I do not see it any other way, the US has the best capital markets in the world and it has the reserve currency of the world. - Is international exposure overrated?